Friendly staff and cool Hostel! I would stay there again!!! 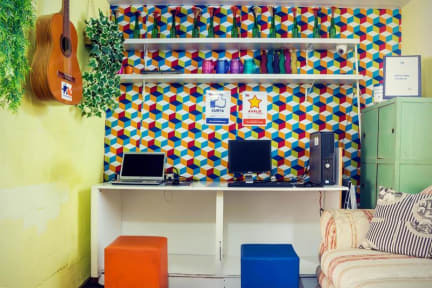 A nice hostel, with cheap fares but good and clean rooms. Very good if you are going to an event at Anhembi or Urban Stage - venues a bit far from downtown São Paulo. Positive point: lots of bathrooms, so you won't lose time waiting for others to take a shower. Negative point: the bunk beds are creaky and their stairs surely do not transmit a sensation of safety. 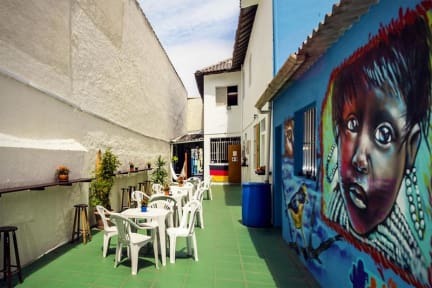 A great stoppover hostel if in transit as its quite convenient to get to the airport ir the bus station. The staff were great especially Pedro was very helpful in answering all our questions. The beds were very comfortable and the breakfast was decent. The only issue I had was the lack of bathrooms which could be irksome in the morning if people are taking showers and you need to use the facilities. Good for the price! Neighbourhood a little sketchy at night, and there was no locker for me. However, I could keep my stuff at the reception, so it was fine. Breakfast is not very good, but for a price this low I was not expecting anything more. So yes, it is exactly what you think you would get for this price. First they did not accept me and I haven't received their notification at all. Then I've gotten a bed, but it is overall a very bad experience, I would never go again. Not one to usually write negative reviews but wasn't very impressed. As a foreign female travelling solo I was made to feel very uncomfortable amongst some of the guests and staff. It wasn't a good vibe. I am a happy and open minded person but this situation and attitude gave me a bad impression. You pay for what you get in regards to accommodation, facilities, breakfast, location etc. But I expected to be treated respectfully and have a lock on bedroom door. Won't recommend nor stay again.